Lavish your skin in luxury with the STARSKIN The Gold Mask™ VIP Revitalizing Luxury Coconut Bio-Cellulose Second Skin Face Mask; a rejuvenating sheet mask that delivers a star-like glow. Working to transform dull, dry and lacklustre complexions, the mask fits closely to the contours of the face and delivers a rich and creamy serum to skin, which acts like a decadent treat. 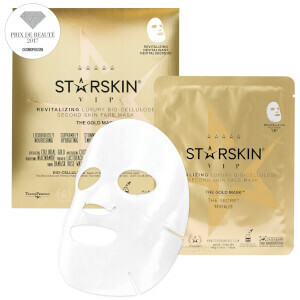 The bio-cellulose sheet mask is drenched in a serum that comprises Evening Primrose extract, which dramatically softens skin, whilst pure Colloidal Gold works to reduce the appearance of fine lines, wrinkles and sun damage. Enhanced by a potent blend of Ginkgo Biloba Leaf extract, Adenosine and Kudzo Root extract, the face mask boosts collagen production in skin, visibly smoothes its texture and lends an overall brightened look. Working wonders in just fifteen to twenty minutes, the VIP mask reveals a replenished visage with an opulent and radiant glow.